PocketCiv finally hit the 30 ratings mark on BGG to finally be given a rank. While it has a true rating of 7.6, it's biased rating is 5.86 (biased due to the fact it has so few ratings), ranking in currently as the 1583rd best game ever invented. And in other news, PocketCiv was subjected to an audio podcast review, which is a strange experience. It's one thing reading someone's comments about your game on a website; it's another thing to hear a voice talk about it. It all sounds so...official. Maybe it's the accent. Anyway, comments and rules clarifications keep tricklling in on PocketCiv, and I've been meaning to get back and clean that game up a bit. Unfortunately, KitchenTable has been keeping me quite busy of late, and I've hit the "man, I'm so tired of working on this" part of the project. The other side of KitchenTable is that I think I'm pretty close to having a releasable beta (after a complete re-write of some elements). Aside from a few issues I need to pick up, I'm currently dealing some higher conceptual issues in regards to how the multi-user aspects work. Unlike a typical online game server where all the objects and graphics are known, KitchenTable relies completely on user-created content. And for a true multi-user game session to take place over the internet, each user must "point" KT to the correct file structure on their local hard-drive, and make sure that they are both pointing to the same image folder and files. This is all trickier than it should be; but since KT knows nothing about the content it is going to use, it just can't simply go to the folder structure "games/carcassonne/images." In the post-post-post Christmas sales at Toys R Us, I wound up buying two Avalon Hill-branded games at Toys R Us at deep discounted prices. Betrayal at the House on the Hill and Vegas Showdown. And I even had a chance to play Betrayal. And what strikes me most about the game is this: how little Hasbro cares. Betrayal gets pretty decent scores on BGG with plenty of "buts....." And I now can see where those "buts" are coming from. Betrayal is a terribly broken game, with all sorts of questions left up to the users to be answered in regards to the Haunts. This is fine for those who peruse BGG. 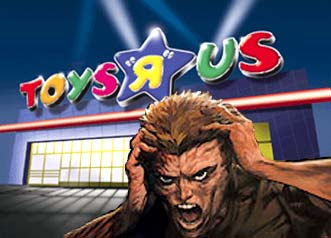 But not for the Toys R Us crowd. The usual person shopping there isn't interested in searching the web for rules updates, errattas, and FAQs. They just want whatever they buy there to work. Mindlessly. Betrayal does not fit that mold in it's current form. What's completely irratating to me is that when you read interviews with Hasbro folk, they talk about how they won't take outside ideas; they have many in-house designers, designing and playtesting, and well, you know, "trust us, we know what we are doing." Did ANYONE within the walls of Hasbro even bother to play this thing before it left the building? We had three people who I would consider professional game designers play in our game. We pretty quickly had to throw out the whole "the good guys secretly read their book while the traitor secretly reads his" thing as things didn't seem to jell for the traitor. Additionally, even after the over-the-table consultations, only when we got to the very end of the game did we realize that the traitor was moving the shadows too fast. In the end, as much as I was hoping to like the game, I doubt it will ever come out again. If you are going to be selling in a mass market chain, you better make sure your instructions are bulletproof, especially in this case: the Avalon Hill brand is so well preserved across all of the titles (in terms of the look of the boxes), that I am completely sure that any casual purchase of this game, followed by any play of it, would result in a few things. One, the casual player would NEVER EVER touch an Avalon Hill branded game again. And two, after Betrayal, I doubt that the casual player would bother trying to "move up"beyond the typical Monopoly/Clue/Scattergories fare, as Betrayal will prove to the casual player that, yes, those geeky advanced games really are too geeky and advanced, and just don't work. And just to prove that Hasbro doesn't care, apparently the original designer of the game asked Hasbro to place on their website his fixes for the game. For some reason, Hasbro denied that request. Well, I guess you can poke through the forums to find some answers about questions by the original designer. Hopefully, instead of Betrayal, they might've picked up Vegas Showdown instead. for 6 months now. Again, my definition of a game is quite different from a die-hard's definition. To me it's simply "a list of rules that a group of people follow for, primarily, enjoyment." And the rules of Exquisite Corpsing are fairly straightforward. You draw a peice of artwork that is 200 pixels high and 450 pixels wide. However, you are given the bottom 15 pixels of someone else's work which you must try and continue, taking whatever visual cues that you can. As with any group of people, certain lingo develops over time that just becomes a defacto standard within that group. I don't think it's a weird sense of insider elitism; it's just a natural instinct to develop cutesy names for things that would otherwise require longer explanations. "Meeples" being a fine example in Euro Board Games, "Wizard Mode" being another in Pinball. Of course, explaining the history and definition on a new member into that group of a strange word that all the members relate to is another issue. But they usually get it. And so, as I started reading comments about various Corpses being posted, often I saw the term "FP" or "Fresh Prince" being tossed around on particular "slices" of Corpses. Quickly, I learned that when you don't even try to follow the visual cues (or at least APPEAR to try to follow them), this is known as being a"Fresh Prince." Which, as you would expect being such an disparate term for such an action, has an amusing origin. I guess it came from this corpse. Of course, there a varying degrees of Freshness. The obvious example being at the link above, but somewhere there is a line that gets crossed as illustrated here in this Corpse off to the side. I mean, c'mon, I spend all this time carefully mixing in the edges for the large face, making an invisible seam with what I think should be a forehead. And then, as a bone, I toss some really nice and graphic red curves for the next artist to take a lead from. And while I can forgive someone just trying to blur out the face on the left, blurring out the red lines just because it doesn't fit into his Tesla artwork just reeks of Freshiness! At least blend those red lines into sparks or something. Or at least just end the lines! GAH! Work on KitchenTable continues during my lunch breaks. It's an interesting project in terms of trying to create something that allows a user to have as much freedom as he wants, while still maintaining a nice, easily understood interface without letting the user break things because f his own whims. And by nice, easily understood interface, I really want none at all. But I'm going to be needing some buttons, whether I like it or not. These are going to be more global in nature, than actual gameplay kind of stuff. Think "load game" and "save game" vesus, "move a token." Actually, it appears that Thoth does this very well. It's working out fairly well at this point. Left-clicking on an object lets you drag it around. Right-clicking pops up a menu of special actions that's specific for that component type. Well, I have to convert the right-clicking to double-clicking due to a new"feature" the latest version of Director/Shockwave added where right-clicking an executable Shockwave will randomly shut the program down on a PC, but I don't need to discuss the gory details of that. Something I've never contemplated up to now is that on the outside, thinking about all the different type of components there are, and how they are used can be somewhat mind boggling to try and define. But ultimately since KT is dumb about the uses of objects, the organization of component types is fairly straight-forward, with just a few differences across types. Ultimately, every object has an image, or a list of images that it could be, it has a location and a rotation. And that's sort of it. For the most part, every object allows you to select an image from it's list. Dice have an additional "pick a random image" action. 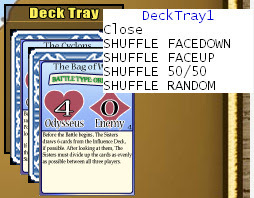 Cards can be rotated (you can set the rotation increments if you are using hexes as cards, or something that requires strange rotations), and only have 2 images: card face and card backs. Now that I've got a lot of the backbone of how the world works, it's been fairly easy to add new component types. Initially, when I was thinking about the structure of how this would all work, I really looked at something like a DECK OF CARDS, and saw a nightmare. How does one define that? Is it really a list of CARD objects? How do I go about manipulating that if I want to shuffle only the cards in the discard pile or a subset of cards? Is the DISCARD PILE a different object, or somehow tied to a DECK? What if the game doesn't have a discard pile for some reason, and is using some card-like kind of thing, like cardboard tiles or hexes? Along those same lines would be this question: how would I go about creating a simple version of Yahtzee? Rolling one die is simple enough with a special "roll" action, but how do I handle multiple dice? 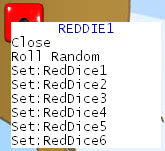 Do I somehow create a way to "hold" dice (ala video poker) that I don't want to roll again? Is there a ROLL DICE button that affects all dice that aren't "held?" Or do I leave it up to the user to simply roll each die individually? It turns out that a lot of these questions got aswered when I finished up my parenting method for moving objects. I use the term "parenting" not in the OOP sense, but in the animation sense. What this means is this: for any given object, it can be "parented" to one other object. This creates a relationship between the "child" and the parent where the child can follow instructions from the parent. The easiest way to imagine this would be a stack of two cards. While each card is a seperate object, the top card is parented to the card directly below it, and if you move the bottom card, the top card will follow maintaining it's relationship in regards it's placement on the second card. At any point you can remove the top card from the bottom card, breaking it's parenting relationship, or place it back on top, re-connecting that relationship. Or swap the cards, reversing the parenting relationship. This is, in fact, what KitchenTable is doing now with all of it's objects. Pick up and move an object, and all of that object's children will follow. Once an object is "dropped," KT checks to see if it has landed on another object; if so, it creates a parental relationship with those objects. You want to stack chess pieces on top of each other, you can do that. Move the bottom piece, and all the others on top of it follow along, and you never have to worry about them dropping! This took some time to work out all of the kinks, but it works pretty well. You can stack components to your hearts content, break apart those stacks, and re-stack things in any different order. They are all just generic objects to KT. And it turns out that this naturally and elegantly solves my questions above. There is no "physical" DECK object; a deck after all is just a stack of cards. But what there is turns out to handle deck functions (mostly shuffling) is a DECK TRAY, and dragging selected stacks of cards into deck tray allows the deck tray, as a special action, shuffle all the cards that have been parented in the tray. Much like collecting cards to shuffle. For the dice, there's a DICE CUP. Put all the dice you want to roll into the dice cup, and those are the only dice that will roll. It all feels very natural and very similar to playing with components on a table. And for prototyping purposes, I imagine this works wonders as it's pretty darn flexible since things aren't "hard-coded" for lists of components. There is no defined list for a given deck, one can fine tune the deck components easily by just not placing those cards on the deck tray, and instead dragging them "off the board." Same thing with rolling the dice. Ever wonder what Risk would be like throwing 8-sided dice for defense, and 6-sided for offense, well, just put the dice you want to use in the cup and find out. And so, the project continues. This has put some of the things I wanted to work on for PocketCiv in the back burner. Which is sort of sad, now that PocketCiv has had a bit of awakening on BoardGameGeek (9 new ratings in the past week and a half. WOO! ), it would be nice to keep that train going. Heck, a guy even made a nice little tech tree graphic for the game! albo: we're the sole remaining big dog in the world. and everybody hates the big dog whether he's pooing on your lawn or handing out free milkbones to all the little dogs. Maud Dib:1,321,851,888 Chinamen would like to have a word with you. prjindigo:Only one in a million chinamen could beat me in a fistfight... and more than half their population couldn't take me 3:1... so I don't give a shiat how many there are, they themselves are not a threat. Why do the chinese employ people for 18 hour shifts or 12 hour shifts seven days a week? They can't get squat done. They work three times harder than us and STILL barely outproduce our country. Individual work output of the US worker is STILL in the top five percent of the global market... the fact that we charge more for it makes people go with china. so, you hold less water than your torn stilsuit. Well, here's to you, Mr. Internet Tough Guy. So when the Yellow hordes cross the Pacific walking across the backs of their drowned illiterate brethren...you'll be ready.